What's important is inspiring students to apply their journalistic curiosity to exploring how new tools can further their storytelling." It’s difficult to deny that social media platforms are changing the face of modern communication. Online tools are a growing part of how news is sourced, published, and consumed. The revolutions in Tunisia and Egypt demonstrated the importance of social media literacy for journalists. Yet integrating social media into university classrooms can be a daunting task for many journalism educators. Professors are typically required to use clunky online systems for grading and communicating with students. It’s an unpleasant experience for everyone involved. These awkward systems don’t inspire creativity, enrich collaboration, or instill a passion for experimentation — all of which are required to survive and succeed in a rapidly changing media industry. This post will examine a few innovative uses of social media that journalism professors are trying out in the classroom. Not every tool is appropriate for every class, but there are undoubtedly ways in which most instructors can find room for at least some of these ideas. Yes, Facebook can play a significant, positive role in the classroom. And no, professors don’t have to become “friends” with their students to make use of it. Facebook Groups provide a place where students can post ideas, links, and even photos or videos. When one uploads content to a Facebook group, neither the action nor the information shows up on a person’s wall. It remains completely within the walls of the group. The main reason to use a Facebook group is that students are already there. They don’t have to remember another log-in or remember to go visit “the class forum.” It fits seamlessly into their lives. It takes very little effort to click “like” or add a comment to a classmate’s idea. This fact alone encourages more interaction than other platforms. Groups come in three varieties: open, closed or secret. “Open” groups are public, “closed” groups keep content private but allow others to see its list of members, and “secret” won’t show up anywhere. 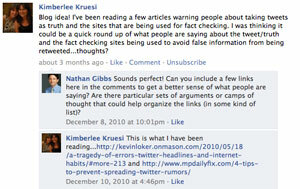 Facebook Pages are used by news organizations to share stories and even to find sources for stories. Journalism instructor Staci Baird has her students manage San Francisco Beat as part of the Digital News Gathering class at San Francisco State University. “I want my students to get used to trying new things, thinking outside the box,” she said. Other benefits Baird cited included “real-world experience” and thinking of Facebook in professional terms. After you create a Page, you can add students as admins by entering their email addresses. This gets around having to add students as friends in order to invite them to participate. Blogs are a great way to expose students to online writing and basic web publishing. Students can post assignments for teachers to see, and the overall blog can contribute reporting to the local community. 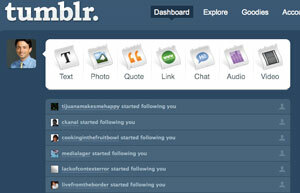 Tumblr has been in the spotlight recently for its rising popularity. It is elegant in its simplicity, standing somewhere between a Twitter feed and a WordPress blog. Mashable community manager and social strategist Vadim Lavrusik uses Tumblr as the primary vehicle for the Social Media Skills for Journalists class he teaches at Columbia University. “Because Tumblr is a social platform, other members of the community are able to follow and keep up,” wrote Lavrusik in a recent post. Each student has his or her own account and can contribute to a collaborative Tumblr that combines everyone’s work. 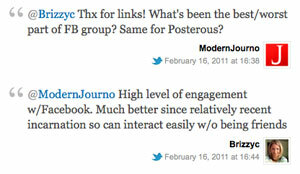 Posterous is similar to Tumblr but has a few key differences. Its signature feature is the ability to post text, photos, or video by simply sending an email. Posterous also offers moderation and group blogs. Educator Wesley Fryer posted a detailed screencast on setting up a moderated class blog. Staci Baird also used Posterous for a mobile reporting class. She said some students were able to use smartphone apps while others could still post via email. WordPress is another free blogging platform. There are two ways to set up WordPress blogs. The simplest way is to create an account at WordPress.com. It’s fast and free, but also limited in terms of customizing its look and features. Through WordPress.org, the source code can be downloaded and installed on any independent web server. This opens the door to extensive customization. Because it’s open source, it allows web developers to create a rich library of free plug-ins that enhance the core components. Journalism professor Robert Hernandez recommends the BuddyPress plug-in to add social and collaborative features. Plug-ins are not available for WordPress.com accounts. Some universities may allow WordPress installations on campus servers, but others have more restrictive IT policies. In this case, teachers may need to pay for a domain name and web hosting to run an independent server. It typically costs around $10 per year to register a domain name; server space to host a blog costs around $5 a month. Hernandez runs his class blogs from a personal web hosting account. Multimedia lecturer Jeremy Rue uses the WP Super Cache plug-in to optimize the server load for self-hosted WordPress blogs. As newsmakers engage on Twitter and Facebook, it’s important that students know how to collect and annotate these messages. Storify, Curated.by and Keepstream all allow users to gather and embed social media messages for use in blog posts and articles. As I was gathering ideas for this article, I asked journalism educators on Twitter about their use of these tools in the classroom. I collected their responses using Storify. While Storify and Keepstream are designed around discrete collections of content, Curated.by is geared more toward ongoing curation. For that reason, I suggest using Curated.by for student coverage of live events or for long-term collaboration. Another useful feature is that it allows multiple contributors to work together on the same collection. Storify does allow users to share accounts as “editors,” but I don’t recommend this because it gives students full access to edit all content in each other’s accounts. The privacy features in Curated.by allow users to limit access to specific projects. Google Docs allows multiple contributors to write at the same time and track revisions. This service is simple and popular. But beyond Google Docs, a cluster of collaborative writing apps may have a more practical use in class. In addition to allowing multiple contributors, they record detailed keystrokes. This means you can replay the entire writing process. Mind mapping, or structured brainstorming, helps organize ideas based on their relationship to other elements. There are several free mind mapping applications, but one in particular offers a useful feature for the classroom: online collaboration. And like the collaborative writing applications, Mind Meister records all actions. I used Mind Meister to begin a class on multimedia journalism. 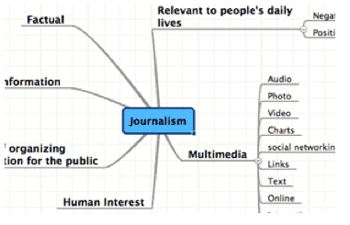 I asked students to define journalism, describe multimedia, and organize how each element related to the others. The mind map tracked the updates as we talked about various definitions. It was fun for them to interact with each other, and it kept them engaged from their workstations rather than watching me write on a whiteboard. Journalism educators need to lead by example and experiment. It’s OK to try something that doesn’t work perfectly. No tool is perfect. In six months, the sites mentioned here will inevitably be upgraded with new features. What’s important is inspiring students to apply their journalistic curiosity to exploring how new social tools can further their storytelling. If you have experience using social services like these in the classroom, I hope you’ll share your perspective in the comments. Nathan Gibbs teaches multimedia journalism as an adjunct instructor for Point Loma Nazarene University and the SDSU Digital and Social Media Collaborative. Gibbs oversees multimedia content as web producer for KPBS, the PBS and NPR affiliate in San Diego. He played a key role in the station’s groundbreaking use of social media during the 2007 Southern California wildfires and continues to drive interactive strategy. Gibbs is on Twitter as @nathangibbs and runs Modern Journalist, a blog for journalists exploring multimedia.